Preface: We suggest staying within the Romantic Zone for overall ease of access to the tourist areas on foot. There are also plenty of public buses that can take you to the outlying areas we mention below. In addition to several budget hotel accommodations, Puerto Vallarta has a few hostels as well. More information is available in the Where to Stay section of this site. DAY 1 – SATURDAY / ARRIVAL DAY: Get settled into your hotel or hostel in the Romantic Zone and review the available amenities. Talk a walk to Basilio Badillo (this street runs perpendicular to the beach) and down Olas Altas (this street is about a half block up from the beach, and runs parallel to the shore) to check out the many budget-friendly dinner options within the area. One particular favorite with budget travelers is Andale at Olas Altas #425 which provides affordable Mexician cuisine as well as a lively, fun and often eclectic bar scene. 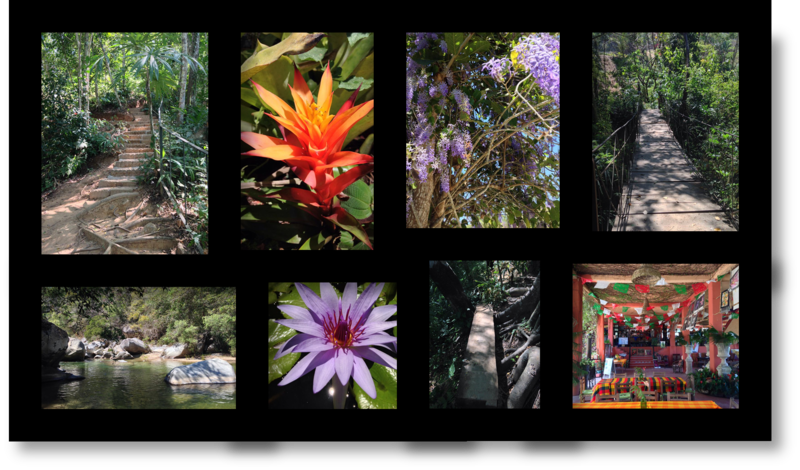 DAY 2 – SUNDAY: Today’s an exciting day, as you’ll be going to Yelapa, the incredibly unique and picturesque little village with a waterfall (a second waterfall is about an hour’s hike from the first). Begin with a continental breakfast at your hotel, or walk over to Basilio Badillo for a nice hearty breakfast at The Pancake House. After breakfast walk up Basilio Badillo to Constitution. On the corner of Basilio Badillo and Constitution, you will be taking a bus to Boca de Tomatlan. Look for white and orange buses that have “Boca” or Mismaloya” written on the front windshield. The cost of the bus ride is 8 pesos. If possible, try to sit somewhere on the right-hand side next to a window. The scenery along the way is just spectacular. The rugged mountains covered in thick lush jungle foliage and the glistening ocean as it rolls toward the beaches is something awesome to behold. The bus will continue on past Mismaloya, the little village where the Vallarta Zoo is, before you arrive at scenic Boca de Tomatlan. Upon arrival there will be plenty of locals to point you in the direction of the beach and pier where you will be taking a water taxi ($70 pesos each way) to Yelapa. Once you board the water taxi there will be a brief drop-off and pick-up of passengers at Las Animas (another really fun place to go) on your way to Yelapa. The trip to Yelapa by water taxi is a quick and enjoyable 35 minutes. It’s a real treat to explore this rustic village and take an easy walk up to the nearest of two waterfalls in the area. After fun and adventures within the village of Yelapa and along the beach, return by water taxi to Boca de Tomatlan. 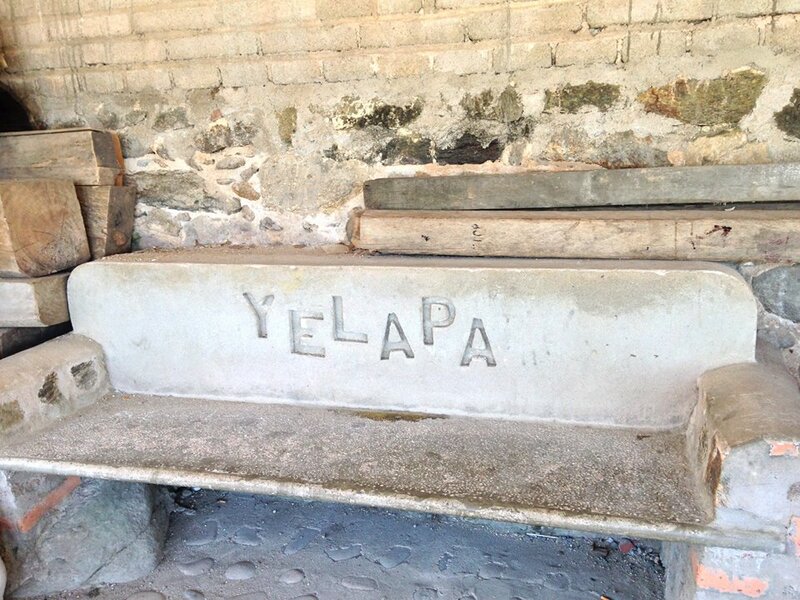 The last water taxi may depart at 5 p.m., so be sure to verify the final pick-up time from Yelapa. Once you return to Boca de Tomatlan, ride the public bus back to Puerto Vallarta. Take a stroll along Los Muertos Beach in Puerto Vallarta and look for the Sea Monkey (their sign has a monkey riding a seahorse) where they serve up $1 dollar beers and Margaritas at tables in the sand. The Sea Monkey offers some budget-friendly menu items as well. For dinner there are numerous cheap-eats places all over the Romantic Zone, with many of them displaying their menus outside, so just walk around and explore. DAY 3 – MONDAY: Today we’re heading out to Bucerias, but first it’s time for breakfast. Walk over to Fredy’s Toucan on Basilo Badillo for a hearty and affordable breakfast. You can also purchase a large muffin here to put in your back pack for a quick snack later in the day. Hop on a city bus heading north to “Walmart.” The bus fare will be about $7 pesos. As always, look at the front windshield of each bus to find out where it’s going. Before boarding you can always verify with the bus driver that his/her route does include your destination. After being dropped off at the bus area in front of the Walmart / Sam’s Club complex, stand facing Walmart. You will see that there are two distinct bus waiting areas. Sit in the larger bus waiting area to your left, as the buses which depart from this waiting area have routes that go outside the city of Puerto Vallarta (to Nuevo Vallarta, Bucerias, La Cruz, Punta Mita, etc.). 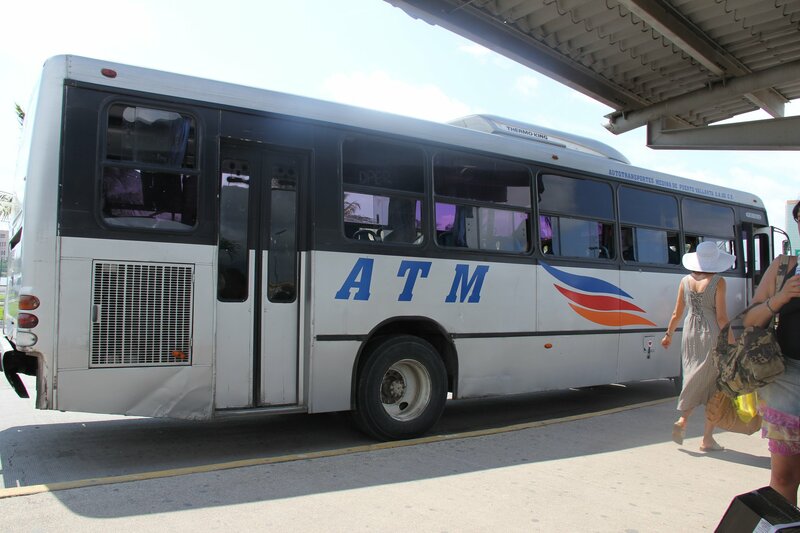 Look for a white ATM bus with wording on the front windshield that states it’s going to Bucerias. There is usually a helpful man with a clipboard shouting out the destinations for each bus and providing tourists with assistance on which bus to board. In 2014, the cost of a bus from Walmart to Bucerias is $14 pesos. In Bucerias spend time on the beach, browse the large open-air flea market, and engage in on-foot exploration of this darling Mexican town. As there are plenty of cheap-eats available within Bucerias, select an eatery that serves up festive flavors that appeal to your appetite. DAY 4 – TUESDAY: The morning begins bright and early with a walk to Yarita Bakery on Basilio Badillo for a wide selection of delicious pastry items for breakfast. Another fun option for baked treats in the morning is to head on down to Los Muertos Beach and be on the lookout for beach vendors “Jose” or “Esteban.” Each of these two men is often referred to by the same title “Muffin Man.” You will easily recognize them as they usually call out “Pastries, muffins, empanadas, cookies” etc. while walking down the beach carrying a large tray of freshly-baked goodies. Although you can purchase the same pastries at Yarita Bakery, it somehow seems just a bit more special when you purchase them from a Muffin Man on the beach. With breakfast in hand, take a walk along the Malecon heading to the Millenium sculpture next to the Hotel Rosita at the north end of the Malecon. You will want to arrive by 9:15 a.m. This is the starting point for the wonderful and FREE Malecon Sculpture Walking Tour which is available every Tuesday at 9:30 a.m. during high season, from mid-November to mid-April, and is led by Gary Thompson who owns Galeria Pacifico. Although the tour is free, it will be much appreciated if you bring tips for the creators of the sand sculpture artwork on the beach along the Malecon, and for the incredible Papantla Flyers. The Malecon Sculpture Tour lasts about two hours and ends downtown at the Galeria Pacifico (174 Aldama Street). No reservations are required, but to avoid any potential disappointment it’s always a good idea to verify tour dates and times by calling the gallery at 322.222.1982. After the tour head down to the Isla Rio Cuale to do a little shopping for gifts and souvenirs. Cross one of the hanging bridges and continue exploring the city, later scouting out a place to have dinner. Getting to know the city on foot is one of the highlights of today’s activities. 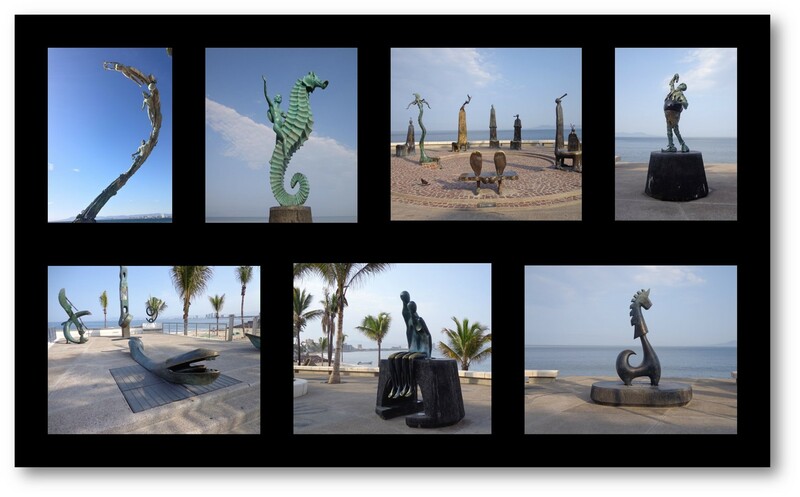 Some of the gorgeous sculptures along the Malecon. The top left-corner photo shows The Millenium statue where the free Malecon Sculpture Walking Tour begins. DAY 5 – WEDNESDAY: Put on your walking shoes and get your camera ready, because today you’ll be embarking on a FREE walking tour of Puerto Vallarta’s historic downtown. This special 2-hour tour is sponsored by Puerto Vallarta Municipal Tourism Office. From a certified guide you’ll learn about the history of Puerto Vallarta, its icons and special places, its beautiful architecture, and its famous people. Puerto Vallarta Downtown Tours depart every Tuesday, Wednesday and Saturday at 9:00 am. in front of the Municipal Tourism Office. The tourism office is located at the south-east corner of the building across from Our Lady of Guadalupe church with the crown and directly across the street from (north of) the Town Square. Until recently this building served as City Hall. On Tuesdays and Wednesdays an additional tour departs at noon. Early Bird Opening: 8 am every Thursday from December to March. DAY 7 – FRIDAY: Breakfast is the cheapest meal of the day, so this is a great opportunity to enjoy eating a delicious meal at a beachfront fine-dining establishment with your toes in the sand. Try Daiquiri Dicks at Olas Altas #314, a high-end restaurant which faces the ocean and serves breakfast at reasonable prices from 9 a.m. until noon. Spend the remainder of the day continuing to explore the town and/or relax along the beach. Early evening take advantage of the Happy Hour 2X1 beer and Margaritas offered by many of the restaurants and bars in El Centro and the Romantic Zone. 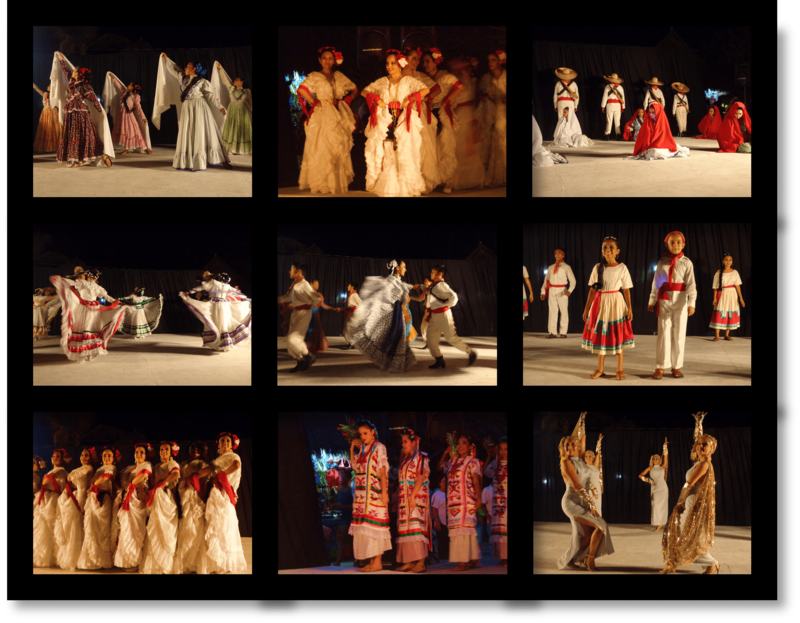 If you are visting Puerto Vallarta during the high-season months November through April, plan to attend the FREE cultural dance performance by the internationally renowned Xiutla Folkloric Dance and Ballet Troupe. It’s a real treat! They perform every Friday at 7:30 p.m. (8 p.m. after the spring time change) at Lazaro Cardenas Park in the Romantic Zone. Arrive 30-45 minutes early to secure prime seating. The spectaular and colorful performance lasts about 90 minutes, so bring along a camera as well as a cool beverage. DAY 8 – SATURDAY / DEPARTURE DAY: After a hearty breakfast in Puerto Vallarta at a restaurant of your choice, it’s time to go back to your hotel and pack your bags. If during your stay you haven’t yet made it by the PV Tourism Office in the old City Hall building across from the Main Square, allow enough time in your morning schedule for a quick trip by there to pick up plenty of tourism brochures, flyers and maps to help you plan out your next trip back to Puerto Vallarta. If you’re traveling light with only a backpack the economical option is taking a bus to the airport. But if your luggage consists of more than a backpack, then taking a taxi to the airport is the more convenient and considerate option as public buses are usually very packed with ridership. Plan to arrive at the airport a full three hours before your international flight back home.